NYC Mayor Bill de Blasio Makes Historic “Vision Zero” Announcement from Streetfilms on Vimeo. Yesterday Bill de Blasio chose the site where Noshat Nahian, an 8 year old boy was struck by an unlicensed truck driver resulting in his death, to announce the first implementation steps of “Vision Zero” in nyc. Not far away from this location, 3 other young pedestrians died after being struck by cars this winter. Many of the families who lost a loved ones in traffic accidents were present at the event during which Bill de Blasio as well as NYC Police Commissioner Bill Bratton and incoming NYC DOT Commissioner Polly Trottenberg presented their agenda to reduce pedestrian deaths in NYC to zero. Bill de Blasio said “There is an epidemic of traffic fatalities in the city and this can’t go on and has to change now”. He also stated that according to statistics by the Department of Health, being struck by a vehicle is the leading cause of injury related deaths for children younger than 14 in the city and the second cause of injury related deaths for senior New Yorkers. Some measures will take place immediately. For example speed cameras which so far have been issuing warnings will now issue tickets to drivers who exceed the speed limit. The installation of speed cameras is relatively new in New York and have been the subject of a long fight in Albany. De Blasio said that he will continue to fight for the city to have the right to install speed cameras and red light cameras wherever data shows that they will reduce the number of car accidents in the city. 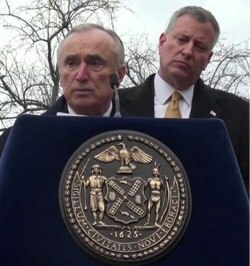 In his speech, NY Police Commissioner Bratton said that: “many serious accident investigations involving serious personal injuries are not adequately investigated” and that he is increasing the number and type of collision investigators so that all serious accidents that lead to serious personal injury and wrongful death will be properly investigated. Previously the only accidents investigated were those were the victims died or were likely to die. Bratton announced that that threshold had been expanded and that accidents where the victim is critically injured will also be fully investigated. This will result in an increase of 20% of investigated cases. In serious accidents, evidence will be gathered as soon as possible so it will not be lost. The size of the Highway investigation unit is being increased from 180 to 270 officers who are being recruited and properly trained with a special focus on serious accident investigation. At precinct level, laser speed measurement devices will replace old technology and traffic safety and pedestrian awareness plans will be incorporated into the mayor’s plan . Disobying a sign or a traffic signal, improper turns, failing to yield to pedestrians, use of a cellphone or texting while driving and speeding will be strictly reinforced.